The motor show in Geneva has ended, with shiny concepts grabbing all the attention, so much that most people forgot to notice what was the greenest car of the show. The greenest besides the electrics or fuel cell vehicles, I mean the greenest car with a normal internal combustion engine. It was a Fiat, but it wasn’t on Fiat’s stand and you can’t even buy it at a Fiat dealer. It had been modified by a third party to make it greener. 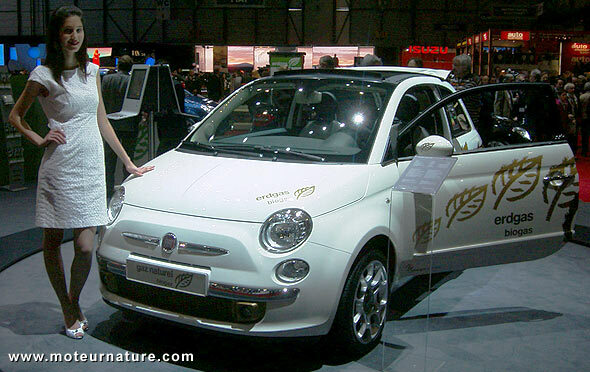 The base is a Fiat 500 C with a TwinAir 2-cylinder engine that has been converted by Gasmobil to run on natural gas (CNG). The standard gasoline model car gets 57 mpg, running on CNG it makes 20 miles with a kilogram of the stuff. Its CO2 emissions are 80-g/km or .35-lb/mile. That’s better than any hybrid without a plug. Natural gas is growing steadily as a fuel in Switzerland. Stations are still scarce, but with a bit of organization, you can manage it. With nuclear energy scaring more and more people everyday, there’s no doubt natural gas has a huge future without any shortage in sight. The US has plenty of it, and about any car with a gasoline engine can be converted for a couple thousands. I expect to see more cars running on CNG next year in Geneva, but also around me in France, and you can expect them around you, wherever you are in the world.